The Yamaha NS-1000M monitor loudspeaker is proof it can be done. ‘It’ in this case is the creation of a unique, inspired loudspeaker that in many ways has no peers to this day. The legendary NS-1000M monitor loudspeakers are hailed in audio circles by those who have heard them and loved by many thousands of owners. I own this pair and it’s these that I base my review on, though I’ve heard several other pairs. All products are a mix of compromises and audio equipment is no different. Still, it’s hard to argue that the Yamaha NS-1000M holds fewer compromises than most loudspeakers. Indeed, the NS-1000M is one perhaps one of the least compromised designs ever produced for the mass market. The Yamaha NS-1000M first hit the market in 1974. Imagine what people thought when they first saw it – in 1974! Everything was brown when these hit the market. Look at the image above and it’s at once timeless and space-age in appearance. They enjoyed a huge production run, for good reason. Manufacture of the NS-1000M continued unchanged until around 1984. My pair has matching serial numbers in the 60,000 range but I’ve seen them with six-digit serial numbers. The Yammies were widely reviewed at the time and widely adopted. The late, great J Gordon Holt wrote this review for Stereophile, back in the day. More recently, The Vintage Knob added this great page on the NS-1000M and there are loads more, all over the web. This classic stand-mounted monitor came in two versions. The NS-1000M features black ash veneer and weighs 31kg. A more up-market version called the NS-1000 comes in a rosewood veneer and features an even heavier 37kg per box. The Yamaha NS-1000M sprang from Yamaha’s wish to create a premium monitor-style loudspeaker for home and studio use. The goal was a design that raised the bar in terms of neutrality and resolution. By definition, monitors are references when mastering and monitoring the mix in recording studios. The goal is to make sure the mix is right and that it will sound right on really good equipment. To achieve this, the NS-1000M features several design considerations that make them extremely desirable for use in a home hi-fi system. Yamaha had all the R&D and resources necessary to create the world’s first beryllium dome drivers, for use in the midrange and treble drivers of the NS-1000M. Why beryllium? Because it is the stiffest and lightest material available for loudspeaker dome design. Stiffness and lightness translate into higher sensitivity, faster transient response and better retrieval of fine detail. These great dynamic attributes help create the incredible air and detail these speakers are known to produce. It is incredibly hard to manufacture and work with beryllium, but its unique properties imbue the NS-1000M with a unique sound. Whilst vented boxes are more efficient, a well designed sealed box will have tighter bass and have a gentler 6db per octave roll-off below the resonant frequency of the bass driver and box. With room gain countering this gentle roll-off, bass response can actually be quite impressive. The typical in-room response is very tight and clean. As you can see from the photo I took of a special NS-1000M sliced in half (thanks Pierre), the boxes are incredibly solid. 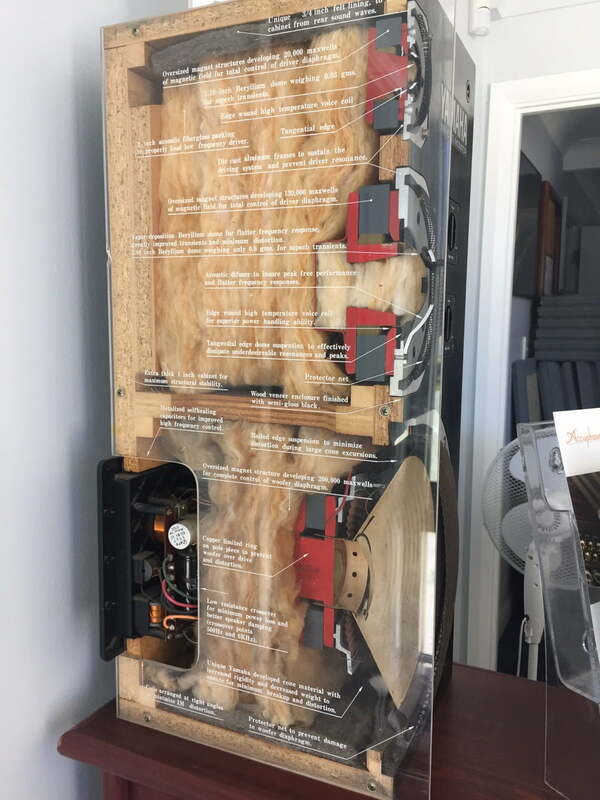 Cabinets are built from a mixture of chipboard and ply, and waste pieces don’t go to waste – they are used as additional stiffening, inside the box. Yamaha utilised extensive internal bracing and cabinet damping materials and even used the offcuts from cutting out the hole for the woofer to brace other parts of the cabinet. Why waste good wood? A sub-woofer can very nicely augment the bottom end of the NS-1000M, with the sealed boxes of the Yammies yielding tight bass down to around 45Hz. Yamaha designed and manufactured all three NS-1000 drivers. They didn’t rely on third-party parts or designs and were able to customise these drivers to perfectly suit the NS-1000. This rarely happens now, drivers are almost exclusively supplied by Scanspeak, SEAS, Morel, Vifa, Peerless etc. All three drivers in the NS-1000M have large magnet assemblies, especially the midrange driver. The large magnets provide a very high magnetic flux density. This, in turn, means the drivers are quite sensitive, which means the speakers don’t need a lot of power to play loud. They do however need a fair bit of power to control them properly. The high sensitivity and good power handling, aid the speaker’s fine detail retrieval and help reduce system distortion. The combined effect of the highly linear motors and lightweight driven elements mean that these speakers exhibit extremely low distortion across the spectrum. In fact, in a famous test conducted by HiFi News back in the day, of all the loudspeakers tested, the Yamaha NS-1000M exhibited the lowest overall measured distortion. Yamaha engineers understood the importance of the NS1000M crossover network and they designed it with only a few compromises. Crossovers are hard-mounted to the rear terminal block. They feature large iron-cored inductors that are unlikely to saturate and non-polar paper-in-oil capacitors feeding the midrange driver. Slopes are all second-order, which minimises group delay and phase inconsistencies. The midrange and tweeter in each box are wired out of phase, relative to one another. This improves dispersion and reduces cancellation effects. Criticisms can be levelled at the series high-pass electrolytic capacitor feeding the tweeter, and the large electrolytic capacitors in the bass network. More on this shortly. One thing that might not look particularly aesthetically pleasing, but which usually preserves the condition of those amazing drivers in the NS-1000Ms are the driver guards protecting each driver. The delicate beryllium domes of the mids and tweeters are rarely damaged, because of this excellent driver protection. These gorgeous beryllium tweeters don’t produce much sound above 20kHz, but what’s there is clean, crystalline treble with very low distortion. Contrast this with the NS-1200 for example, featuring very similar, but unprotected drivers, almost always horribly dented and damaged. In a word, amazing. Airy, clean, smooth, tight, wide open, like electrostatics in some ways. Really good systems benefit enormously from the insight afforded by a pair of these babies. The reality is that there is nothing new in speaker design. Even without modification, these speakers sound remarkable, refreshingly clean. The NS-1000Ms are fast, precise and have amazing off-axis performance. You’ll get a great mid and high-frequency response from all around your listening room and very little beaming. A complaint often levelled is that the NS-1000Ms sound bright. It’s true that they are brutally revealing of poor source equipment and material. If you have a harsh sounding CD player or bright amplifier, it will probably be tough going. Much of my audio setup utilises Class-A amplification and this certainly helps by giving you a smooth starting point. Even so, with poor recordings, they can be brutally unforgiving. Choose good recordings though and these speakers will give you more of the music than you may have ever heard before. The NS-1000M certainly also favours tube amplifiers and wonderful synergy can be achieved, as kooky Mr Lim of the Affordable Valve Company notes here. You can incorporate better capacitors into the crossovers, to great effect. A good starting point is to replace the series capacitor feeding the tweeter. Try a modern MKP or MKT capacitor, or even a vintage paper-in-oil (PIO). Bypass everything with 0.1uF film caps and you will be ‘cooking with gas’ as they say. I also replaced (bypassed) the capacitor array feeding the mids. In their place, I used precision Russian military paper-in-oil capacitors, bypassed with a small MKP capacitor. This yielded a useful improvement in performance, most notably clarity and harmonic richness. I also replaced the large bipolar electrolytic capacitors in the network feeding the bass driver with gorgeous ERO vintage parts. I matched these caps to very tight tolerances. Here you see the large red Russian paper-in-oil (PIO) capacitors that I used in the midrange filter. The larger one is the series capacitor feeding the midrange dome, replacing the array of silver caps at the bottom. Paralleled with this is the green MKP cap you see out to the left, yielding the required 21uF. The smaller PIO cap feeds the tweeter, paralleled with another ERO MKP film cap. Note I’ve bypassed each cap array with a mil-spec Siemens 0.1uF film cap. I graded the Russian PIO capacitors. They were scarily close to their rated values, both 19.7uF, very impressive. I used hot glue to hold things in place. The cabinets are incredibly solid and you can do little to improve them. I highly recommend replacing the fasteners that hold the drivers onto the baffle. I use marine-grade stainless steel Allen bolts in place of the Philips-headed screws. Allen bolts allow you to torque the drivers down tightly and are a definite cosmetic improvement. You might also improve the factory speaker terminals, which are flimsy and only accept small gauge bare wire. I replaced them with gold-plated brass binding posts. These fit conveniently onto the existing mounting plate and look almost like they came that way from the factory. Replacement gold-plated brass speaker terminals. One thing you will need to get the most out of these great transducers is a good pair of stands. Stands for the NS-1000 are not easy to find. They are the SPS-500, check them out. It’s almost impossible to get a pair of the original Yamaha stands because owners just aren’t selling them. Instead, I decided to design and build a pair that would be easy for the average DIY’er to manufacture. I’ve written an article documenting the build of my DIY NS-1000 speaker stands here. In engineering per dollar terms, there’s no way Yamaha could sell the NS-1000 now for less than 10 grand a pair. There’s just too much custom engineering, metal, wood and beryllium. If you find a pair, in good condition, with undamaged drivers and matching serial numbers, grab them. Nothing for sensible money comes close. Seriously. Yamaha has in fact decided to resurrect the venerable NS-1000M in the form of this monster – the stunning new NS-5000. You can read the full story here, with loads of tasty details and an interview with the chief design engineer. Yamaha has just released the NS-5000 in Australia, with a recommended retail price of – wait for it – $ 19,999!! Who knows how they will sound, but looking at the details, it’s hard to imagine the that NS-5000 will sound anything less than spectacular. Thanks for the review. Two comments: could you elaborate on the type of caps you used to replace the electrolytics across the bass driver? Did you hear any difference with this change? Did you hear much change with the tweeter cap substitution? Did you know that Yamaha on page 3 of their owners manual, under “Speaker Placement”, l says “The best location is one in which the speakers are placed with their backs against a hard wall.” This is contrary to what is usually done in contemporary set ups and could go some way in explaining the light bass balance so often mentioned when describing these speakers. I recently bought a pair to mix and master recordings, on the strong advice of a very seasoned recording industry veteran, a mixing and mastering engineer since 1973 or so. He feels the amp is very important and the best he had heard the NS-1000s that he used for 30 years was with the Yamaha B-1 V-FET amp. I could not afford one of those—they still command top dollar—but what I did get is, I think, another undiscovered Yamaha treasure: a B-2 amplifier. The combination of power, sound, metering and control flexibility (and current price) make this a knockout. Think about this: the retail price in 1976 was 200,000Y, about $2500 today and a ton of money back then, yet they sold around 10,000 of them. The owners manual for the NS-1000 suggests the B-1 and B-2 were intended to partner with the NS-1000, and it sure sounds that way. The bass is very tasty (I’m a closet bass freak). Hi Russell, thanks for your comments and for filling out my feedback pop-up and my pleasure regarding the review. A few comments in response to your questions. First, the replacement capacitors I used in the low-pass filters were premium EROs from memory. These are a laboratory/military grade cap and I used pairs that I tested to measure precisely 94uF, as per Yamaha specs. I did hear a difference with this change, but less so than with the changes I made to the mid and treble networks. The low pass filter is likely to change the cutoff frequency only, and these caps are not in series with the bass driver. The tweeter and midrange capacitor changes yielded more dramatic results, as you would expect, given that these caps are in series with these two drivers. These are well worth experimenting with, especially the tweeter, as this cap is a low quality electrolytic and needs to be changed. The midrange caps are better but paper in oil replacements still made a noticeable difference. I was aware of the suggestion to place these close to or up against a wall and this will definitely yield better bass response, though likely also poorer articulation and clarity, some experimentation is suggested here! I’m very glad to hear that you bought a pair of these wonderful speakers and I wholeheartedly agree that the Yamaha VFET amps are a superb choice to drive these speakers. The quality of the VFET amps is well known, but the impossibility of finding any spares for the fragile VFET devices means that counterfeit items are everywhere and many amps will no longer contain original, genuine VFETs. If you have a B-2 with genuine VFETs, look after it!! Hi George, yes I generally agree, though this will vary according to room furnishings, brightness and ancillary equipment. There are also issues if the attenuator knobs are ever removed, as Yamaha provided no instructions to correctly index the knobs upon reinstallation, meaning there can be unit to unit variation if these have ever been removed! Generally though, the -3dB setting is good in average and brighter suburban environments. I believe we are moving back into the era of Hi Fi. vinyl will be the stimulus for sure. Its a just a matter of time before those buying vinyl will be experimenting with improving thier sound. Think that leaves a great opportunity for some one to move in with moderately priced systems and not high end with an attitude of education. PPS should have a blog space for interaction. Would these be a good fit with my pioneer sx 1250 reciever ? Or is it to much power for them to handle? Hi Steve, these would be an excellent match. They are very conservatively rated for studio use in mind. I’ve been driving them with a Krell KSA-150, and they’ve never been stressed! Hello and thank you for this well written article. I really like the appearance of your marine grade stainless steel Allen bolts. Would you be so kind to share where I could purchase them and perhaps the item number on top for both the woofers and the tweeters/midranges? Thank you! Hi Joe, glad you like the bolts, me too. I purchased these from a local fastener supplier and I couldn’t tell you part numbers etc as I don’t know them. I suggest you take one of each size to your local fastener supplier and see what they have. If there is enough demand, I might consider selling a bolt kit..! Hi Mike and thank you for your reply. There is a number on top of the bolt, but I just can’t quite make it out. I currently have 3 pair of NS-1000Ms, one pair of NS-1000s and a pair of NS-2000s. A buddy of mine and I also recently partnered on a pair of his retro-mod NS-1000Ms cabinets in original ash veneer and my extra components. Pretty interesting look. We definitely need these bolts to complete the look, though. Thanks again! Hi Joe, sounds like you have some great Yamaha speakers there! The number you mention is brand and bolt spec, not part number. My best advice is to take one of each of the standard fasteners to a reputable fastener supplier and obtain stainless allen-headed replacements. These are metric of course, you may struggle in North America to find metric bolts but someone will have them. of being a young serviceman stationed in Japan in 1976. Wanting to get some good audio gear I asked friends for recommendations. Those were the speakers suggested. I took the train into Tokyo and listened to them in an electronics store, and was impressed. Could barely communicate with the salesman, but purchased them, anyway. With some rope they provided me I carried them both back on the train, to the base. Enjoyed them there, and shipped them when I returned to the US. Since then, they’ve moved many times around the US. All the other audio gear from those days eventually wore out. I was thinking these were sounding a bit dated until last week when I replaced and old receiver for a new yamaha av model. OMG, they are again sounding amazing. I was curious if they were still available and what other’s experience with them was/is and I came across your post. As a musician and music producer, I’d say they are still the best purchase I ever made. These days, I’m lucky to carry one of them at a time. With the exchange rate then, and getting them in Japan, I paid about a third of what they would have been in the US. As long as my ears are working, I’ll likely keep them. Thanks for the nice info on fixing them up, when necessary. Hi and thanks for your comment. What a great story and yes, I think many people now realise just how incredible these speakers really are. Ground-breaking in many ways and with no real modern replacement. With a little TLC, they can be made to sound even better and I’m sure your pair will continue to give you the same musical enjoyment and insight mine give me.